We are always striving to provide our community with great creative and educational content for your business and personal growth. That’s why we have partnered with some amazing brands and companies. You can find out more about the companies we have partnered with by visiting our R.A.L.P Library. NOTICE: All our Rachael Academy Partner Pages have affiliate links, meaning Rachael Academy earn a small commission if you sign up to any of our partner products. We only ever recommend services we feel will absolutely benefit the community. Entrepreneur Aaron Rasmussen and film editor and director David Rogier started Masterclass in 2015. Based in San Francisco, it’s an online education platform for creative professionals. Of course, you don’t need to travel to San Francisco to take a Masterclass. 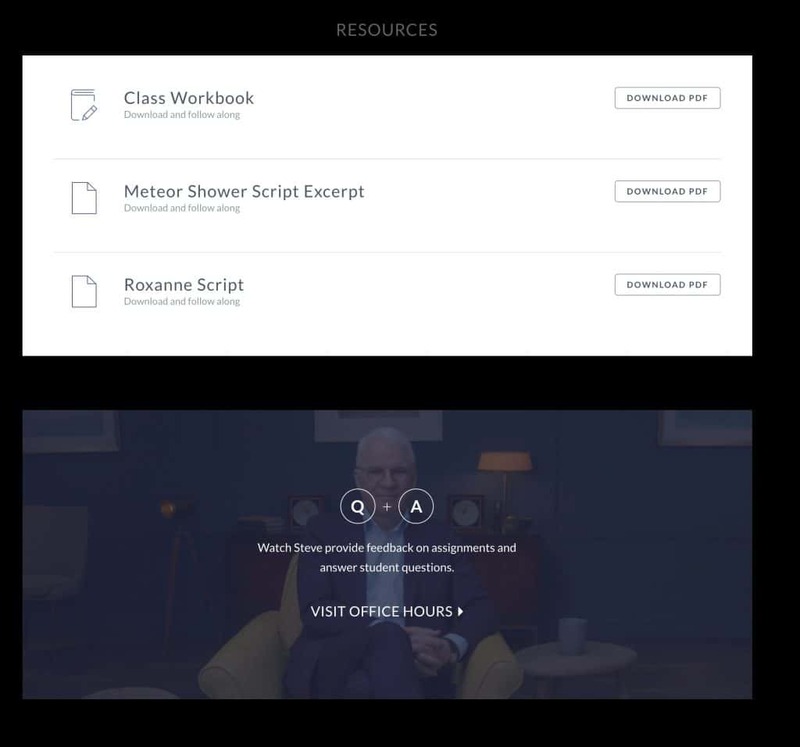 You can watch Masterclass courses using your computer or phone and consume the materials at your own pace. As a student, you can learn the art of comedy from Steve Martin, writing thrillers from James Patterson, dramatic writing from David Mamet, screenwriting from Aaron Sorkin and lots more. It is a great way of learning online from top creators you would not normally have access to. Masterclass is for writers, photographers, artists, musicians, painters and creative professionals. It’s ideal for students who are happy to learn at their own pace using a computer. Unlike Lynda or Treehouse, Masterclass is suitable for writers, musicians, artists and creative professionals. This is an interesting niche. Many of the other online courses I’ve taken help students learn business skills like marketing or more practical skills like coding or web development basics. Masterclass isn’t ideal for people who thrive in classroom environments and prefer a more hands-on approach from teachers. What is a Masterclass Like? Each video averaged between five and 10 minutes, which was digestible enough for me to watch at lunch. I’ve admired Martin’s comedy and films over the years and took his class first. He condenses everything he has learnt about the craft of comedy and draws on many anecdotes from his colourful career. That’s a lot of insights, as he’s 72! In the real world, it’s difficult to get access to quality materials like this. 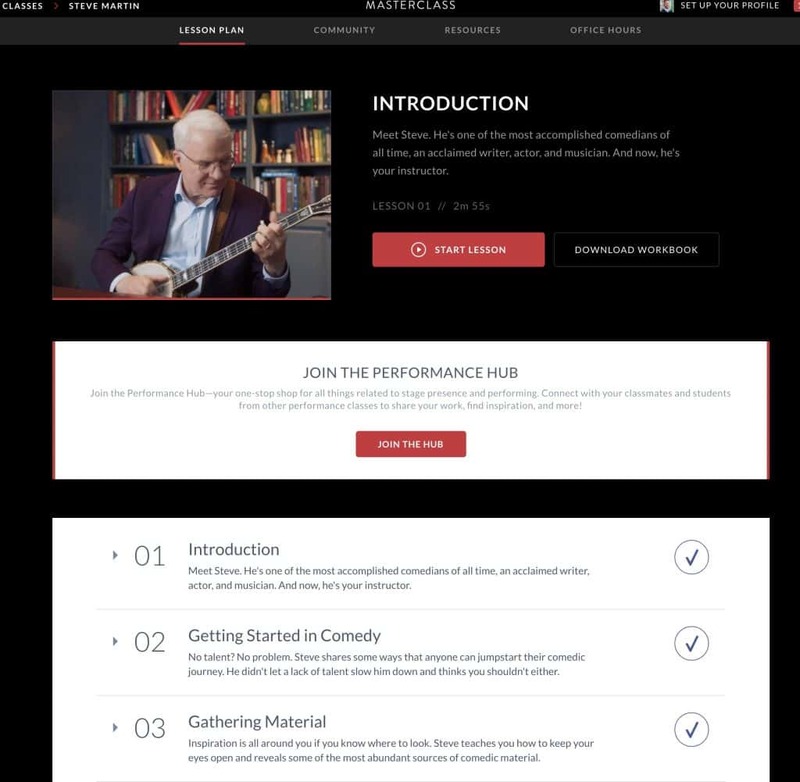 Steve Martin’s Masterclass course contains 25 lessons. It took me several weeks to get through these for this Masterclass review, but that’s only because I took a break when I got the flu. What Masterclass Should You Take? If you’re interested in studying online, you probably already know which Masterclass courses to take. Meanwhile, a musician is more likely to take “Deadmau5 Teaches Electronic Music Production”, “Herbie Hancock Teaches Jazz” or “Christina Aguilera Teaches Singing”. 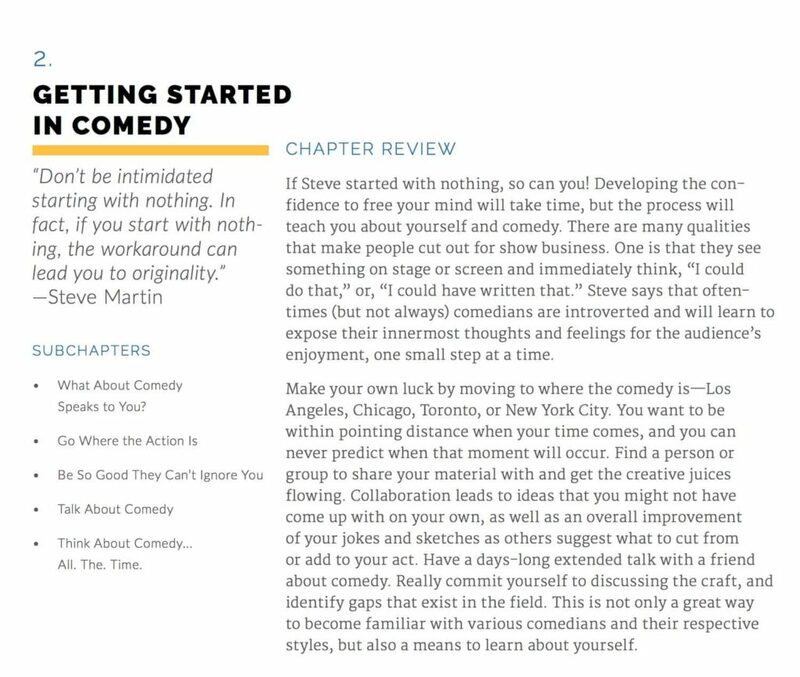 First, I took “Steve Martin Teaches Comedy” first because I wanted to learn how to inject more colour and comedy into my writing. I’ve no desire to become a stand-up comedian but I’ve always admired Martin! Next, I took David Mamet‘s Masterclass because I was interested in learning from a dramatic writer and Mamet is writer’s writer. What happens if they don’t get it? In between these Masterclasses, I watched some of the lessons on Aaron Sorkin and James Patterson‘s courses. I’ve watched most of Aaron Sorkin’s shows and films over the years and was more than happy to watch him reveal how he writes. Finally, I completed all of Malcolm Gladwell‘s Masterclass. As you can see, I took most of the Masterclass writing classes as this is where my area of interest lies. I took this Masterclass at the end of 2017. I was familiar with Martin’s comedy. I’ve read his autobiography Born Standing Up and watched a lot of his stand-up shows. Martin was a teacher I could learn from. In his Masterclass, Martin talks about how to find your comedic voice and how he writes and delivers jokes. Martin’s workshop includes materials from aspiring comedians and turns some 5/10 jokes into 9/10 laugh-out-loud jokes. This masterclasss was a fun insight into how the comedian Steve Martin approaches comedy writing. He also reflects on his career on stage and screen. Each lesson was relatively short, included supporting PDFs and reading materials, and next steps. Martin is an engaging instructor too. If you take this class, I’d recommend reading his book Born Standing Up so you have some context to what he teaches. I recommend taking this masterclass if you want to improve your comedy writing skills or are fan of Steve Martin’s work. I took the Malcolm Gladwell Teaches Writing Masterclass almost as soon as they released it earlier in 2018. I write a lot of non-fiction and am a big fan of Gladwell’s work including his books Blink and Outliers. Gladwell said he found himself in a curious position whereby the book’s ideas and arguments were often misconstrued by others. I recommend taking this masterclass if you want to improve your research and non-fiction writing skills. What Are Some Great Classes Available On Masterclass? Depending on your interests, there are loads. Over the past 12 to 24 months Masterclass has broken out into other areas. For example, Serena Williams teaches tennis as part of her Masterclass. Gary Kasparov teaches chess. Herbie Hancock teaches jazz—and herein lies one of the other issues with Masterclass. It’s hard to imagine a student will have an interest in all of these Masterclasses, no matter how great the topics are. So while I found the writing classes useful, I’m unlikely to learn country music from Reba McEntire anytime soon, no matter how talented she is. If you’re a writer, consider how well you know James Patterson’s works and if you want to write thrillers before you sign up to his class. While you could take the “James Patterson Teaches Writing” Masterclass without knowing much about his books, you will learn far more if you’ve read some of his thrillers. A Masterclass costs €70 or $90 and comes with a 30-day money-back guarantee for unhappy students. If you’re taking more than one Masterclass, I recommend buying the All-Access Pass for €150 or $180 per year. You’ll save several hundred dollars in the long run. However, remember not all Masterclasses will be relevant. If you’re wondering does Masterclass offer free trial? They offered a free trial up until August 20th 2018. This is no longer available so your best option is the All-Access Pass. A Masterclass course typically contains 25 video lessons, each of which is five-to-ten minutes long. In some cases, the teacher speaks straight to camera. In others the instructor works with their students’ efforts in front of the camera. Some video lessons also include extracts from the teachers’ works. 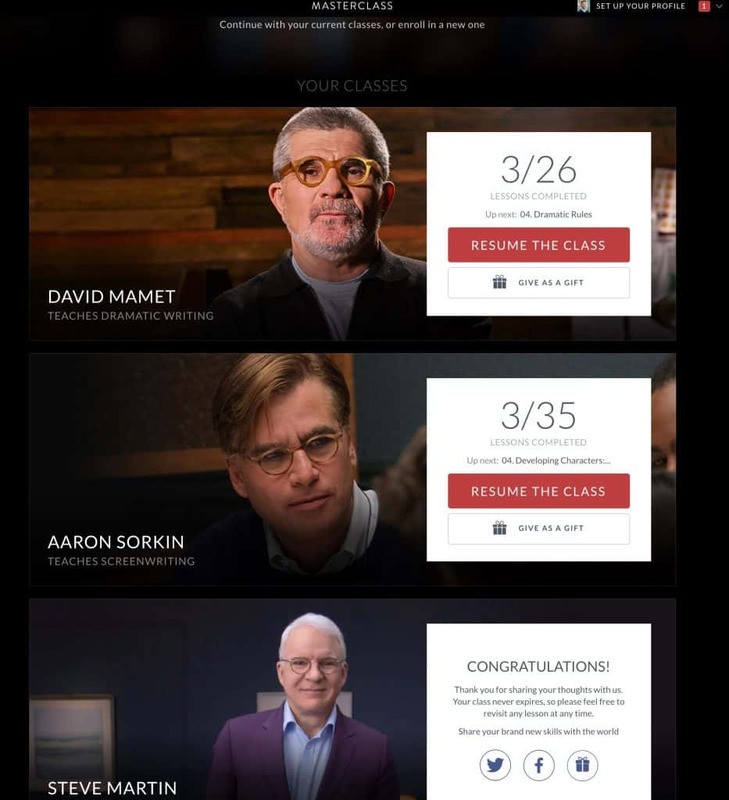 You can take a Masterclass online at your own pace, watch them on your computer or phone using the Masterclass app. Each Masterclass comes with background material, downloadable worksheets and reading lists to peruse. The class workbook summarises the key points in each video, provides additional reading materials and provides space to write notes. Masterclass emphasises the community aspect of its online learning. They’ve created a Hub where you can engage in discussions and ask questions about the classes. You can also post some of your work. For example, one student posted his lesson notes and take away from David Mamet’s rules for screenwriting. Although I spent little time in the Hub, it’s a good resource for students who value learning from other students too. I joined Masterclass in October 2017. 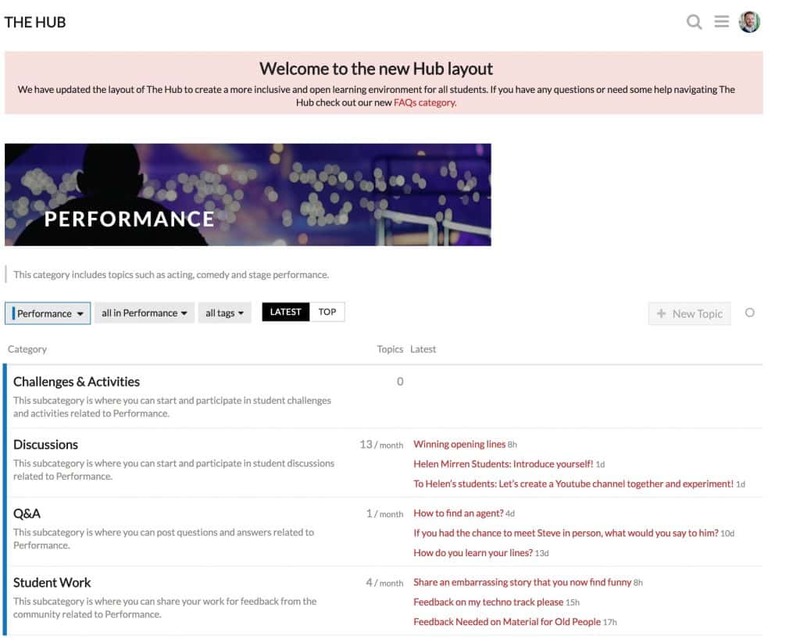 Since then, the team has rolled out a number of improvements to the Hub. Masterclass also features office hours. Here, students can ask their teachers questions. For example, one student, John Zucker, asked Martin how to find your voice and received a reply. Unfortunately, most of the Masterclasses have only a few replies. However, nothing is stopping you from recording a question, uploading a video or even writing in. While writing this Masterclass review, I felt inspired to watch many of these great professionals talk about the creative process, their art, books and more. In some cases, they were condensing a lifetime’s experiences. It was nice for Steve to get in touch! The production quality of Masterclass videos is also first-rate. They are shot in high definition and tightly edited. If you’ve taken online courses, you know the quality of lesson materials varies. That’s not something you need to worry about here. Masterclass regularly adds new materials from people at the top of their game, such as “Malcolm Gladwell Teaches Writing”, which I immediately added to my watch list. I also liked the Masterclass App for iPhone. It was easy to use and I was able to save lessons as favourites, adjust the playback speed and watch them over a cup of coffee at lunch. Compared with other creative courses, Masterclass is also affordable. For example, you can spend thousands of dollars on an MFA. Or you can spend several hundred dollars taking online writing classes. With Masterclass, you can start learning for as little as €70 or $90. 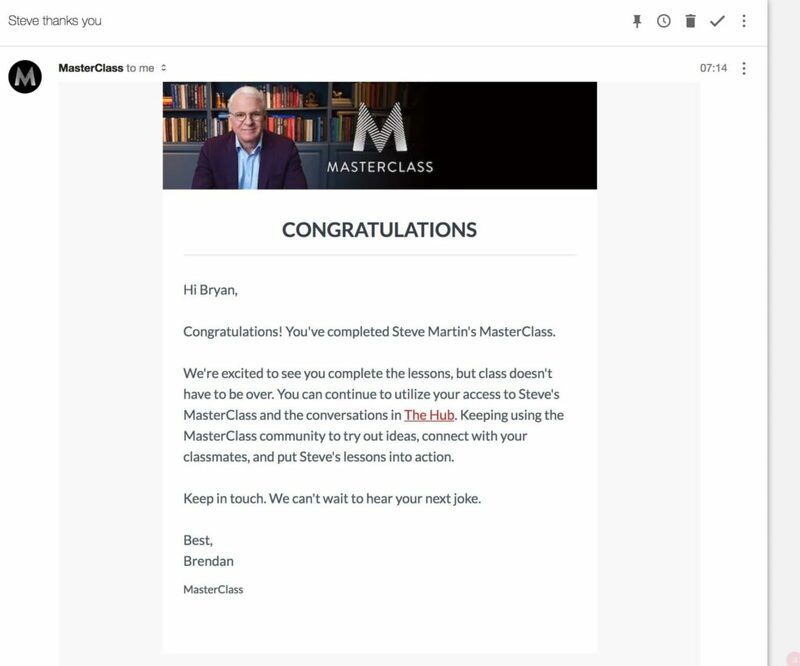 The creators of Masterclass are going after a wide audience. In some cases, I felt like the teachers were speaking to many people with different interests. Some of the classes felt like the teacher was riffing on the topic. I’ve taken several in-person writing classes and, although I’m a believer in the power of online learning, it’s difficult to replace the one-to-one feedback you can get from a teacher in a classroom environment. Unlike some online courses, you also can’t download the video lessons. Still, for just €150, I can’t complain. Takeaway: Masterclass is a complement to, rather than a replacement for, other kinds of learning. Are Masterclass Classes Worth It? Over the past 10 years I’ve taken writing classes in a traditional classroom environment, participated in weekly writing groups and taken several online courses on topics like blogging. I even studied journalism in college. In other words, I’ve tried lots of different kinds of online and offline learning classes. Each style has pros and cons. What you get out of them depends on how much time and money you can invest and what kind of learner you are. I recommend Masterclass to writers and creative professionals who are on a budget. Pick one Masterclass and see if it’s for you. The All-Access Pass is useful if you plan to take more than one class. For a modest amount, you can invest in your craft and learn from current experts without investing thousands of dollars in a fancy MFA. Masterclass also is useful for creative professionals who are further along in their careers but want to keep up by learning from masters of their professions.